On DDD, the &apos;68 Camaro and I have traveled this country coast-to-coast, top to bottom, and around again. From fish tacos in Cali to pastrami in NYC, I&apos;ve eaten my way across the Great American Culinary landscape and discovered some of the most off the hook joints in this great country. I&apos;ve been to my share of Triple D-approved restaurants across the country, and the one thing they have in common? They really are off the hook. As he told The Hollywood Reporter last month, his reactions to the food he tastes are not staged: "If I don&apos;t like it, you&apos;re either not going to see it on TV, or I&apos;ll say something like, &apos;It was good.&apos;"
Guy is certainly no stranger to Los Angeles, a metropolis absolutely packed with all kinds of bomb joints. So let&apos;s revisit some of the most money places Guy has graced with his presence. This is perhaps peak Triple D. Fat Sal&apos;s, for those not in the know, is a sandwich stand in Westwood Village "just blocks from UCLA." But...as is the case with everything on Triple D, it is so much more than just a sandwich stand. For Fat Sal&apos;s is owned by none other than Jerry Ferrara, the actor who played Turtle on Entourage. And you know Guy is a huge fan of the show! In fact, the Fat Sal&apos;s signature sandwich—the Fat Jerry—is named after Ferrara. It includes chicken fingers, mozzarella sticks, and french fries, piled on what&apos;s called "Fat Bread" (i.e. a long sandwich roll) along with bacon, eggs, Philly cheesesteak fixins (steak, onions, cheese), and garnished with a little ketchup and mayonnaise. One dude who was interviewed for the segment laid out the perfect day in Los Angeles for his friends visiting the city. "I take &apos;em to the Hollywood sign, I take &apos;em to the Walk of Fame, and I take &apos;em to Fat Sal&apos;s." Hell yeah you do. We&apos;d like to give a nice solid fist bump to another person interviewed said, "I&apos;m not going to lie, the only reason I come to Westwood is for Fat Sal&apos;s sandwiches. I have no idea what else is here." Honestly? Nothing. If you like to consume your appetizers in your sandwiches and not before them, enjoy Entourage, and don&apos;t mind Westwood, then Fat Sal&apos;s is the place for you. Fat Sal&apos;s is located at 972 Gayley Ave. in Westwood, (310) 208-5071. There is also a location in Hollywood, at 1300 N. Highland Ave., (855) 682-4373. Guy is definitely a big fan of hot dogs, but rather than visit a highly-publicized place like Pink&apos;s, Guy heads for the Valley—a very "Triple D" kind of place. Fab Hot Dogs in Reseda features a "Double Texas Burrito Dog," which is two steamed weenies, slathered in chili, cheese, bacon, crumbled corn chips (duh), all wrapped in a tortilla. As the owner Joe Fabrocini begins to describe what goes into the Double Texas Burrito Dog, Guy, in a hushed, reverent tone says quietly, "That&apos;s good." He also gets really excited when he properly identifies "Mexican oregano" as one of the ingredients in the "Bald eagle sauce," the relish element on the deep-fried dog known as "The Ripper," which happens to be LAist Editor-in-Chief Carman Tse&apos;s favorite dog on the menu. "Bald eagle sauce: money," says Guy, as he proceeds to "invent" a "Bald eagle lettuce wrap" which is essentially just the sauce slopped inside a leaf of iceberg. We bet if you went to Fab Hot Dogs and asked for one, they&apos;d probably make it for you! It&apos;s vegan. Guy closes out the episode by asking permission to call Fabrocini the "Wizard of the Weenie," before he flashes a quasi-westside gang sign by forming his hands into two interlocking "W"s.
Fab Hot Dogs is located at 19417 Victory Blvd #12 in Reseda, (818) 344-4336. We here at LAist are big fans of Koreatown&apos;s Beer Belly, and have sung the praises of its very Guy-friendly menu: ridiculous mac & cheese, pork cheek chili cheese fries, and deep fried Pop Tarts are just a few gluttonous options. When Guy visited the joint for Triple D, he focused on the duck: particularly, the "Death by Duck" french fries, which slathered in duck fat, piled with duck confit and garnished with duck cracklins. "A duck version of chicarron?" Guy laughs. "Haha, yeah, I&apos;m on board!" So are we, Guy, and yes, your declaration that it was "so ducking delicious" was original, and as hilarious as you thought it was. Beer Belly is located at 532 S. Western Ave in Koreatown, (213) 387-2337. "There&apos;s a lot of really hot topics going on in food right now, and one of them is fast food, or not," Guy eloquently explains to the camera after emerging from his 1968 Camaro. "My position is this: quality, not quantity, hand-made, not over-processed." And from what he&apos;s heard, Guy says that the Oinkster in Eagle Rock is "just that." So let&apos;s head on in! What do the customers have to say about it? "The food is tremendous. There&apos;s different flavors," says one extremely descriptive man. The Oinkster does boast all kinds of typical grub found at fast food joints: Burgers. Fries. Rings. Lots of meat, on everything. And you KNOW once he pokes the meat, he&apos;s got no other choice than to cram it in his mouth. The Oinkster is located at 2005 Colorado Blvd. in Eagle Rock, (323) 255-6465. There&apos;s another location at 776 Vine St. in Hollywood, (323) 536-9248. This little place in a strip mall down the street from the Sony lot epitomizes what Triple D is all about. Guy rarely goes to the most popular or hippest place; you&apos;re not likely to spot him enjoying a trendy bunch on a sunny patio. And in a city with such vastness and enormity as L.A., often times the best places to actually eat are overlooked: it&apos;s common knowledge that some of the best places to eat in L.A. are in grungy strip malls. Tub&apos;s fits this bill. "If you wanna get like, crazy with your chili, you come here," says one guy interviewed. This episode includes a nice segment one of my favorite features of the show: mixing together a spice blend! All of the ingredients are portioned out in the ubiquitous clear plastic containers just so, that when they are dumped into a large metal mixing bowl, it is pleasing to the eye. We also learn a lot about Guy in this episode, for example, that kidney beans are "one of [his] favorite beans" and he&apos;s "a sour cream guy." But he also drops some poetry. "This is what makes coming to L.A. so beautiful. You&apos;ve got funky little joints like this doing rockin&apos; business." And with this, Guy simply encapsulates so much about what we love about Los Angeles, and what makes it so unique. Tub&apos;s Fine Chili and Fixins is located at 4263 Overland Ave. in Culver City, (310) 559-8827. Southern California isn&apos;t really known for its barbecue. Barbacoa, maybe—but for the legit stuff, you&apos;re better off elsewhere to be quite honest. But as Guy notes, Baby Blues isn&apos;t trying to be anything but a fusion of three different styles (Texas, Kansas City, Carolina). If you will: this is Southern Californian barbecue, and yes—it&apos;s off the hook! "You guys know out here in California when we do barbecue: it&apos;s called grilling," he says with a smirk while talking to the chef-owners. In this segment, Guy goes hard on some ribs. He picks up a "Texas-style beef rib" and goes, "Whoa! This musta been from Paul Bunyon&apos;s blue ox!" as he waves the rib above his head, torch-like, in the cramped kitchen. They also say "penetrate the meat" three times in 15 seconds when discussing preparation for the pulled pork, and I am 13 years old. Baby Blues BBQ is located at 444 Lincoln Blvd. in Venice (310) 396-7675, and in West Hollywood at 7953 Santa Monica Blvd., (323) 656-1277. Ok, here we finally have Guy getting into some Latin flavors with this trip to Gloria&apos;s, a Salvardoran/Mexican joint in Palms. As Guy notes, Gloria Flores, after having worked in restaurant kitchens for 14 years, saved up enough cash to open her own spot, but only served Mexican food at first because people&apos;s palates weren&apos;t ready for Salvadoran flavors. The Salvadoran fare—pupusas, fried yucca, adobada—wasn&apos;t introduced until 1995. One would think Guy would head straight for the menu item most akin to a quesadilla (the pupusa), but instead, they feature a "Seven Seas" seafood soup, relatively exotic fare for Guy, by which I mean, this isn&apos;t the kind of thing you can top with Dorito crumbs and chicken fingers. But he loves it, in fact saying "it&apos;s so good you will literally go out of your mind." Gloria&apos;s Cafe is located at 10227 Venice Blvd. in Palms, (310) 838-0963. 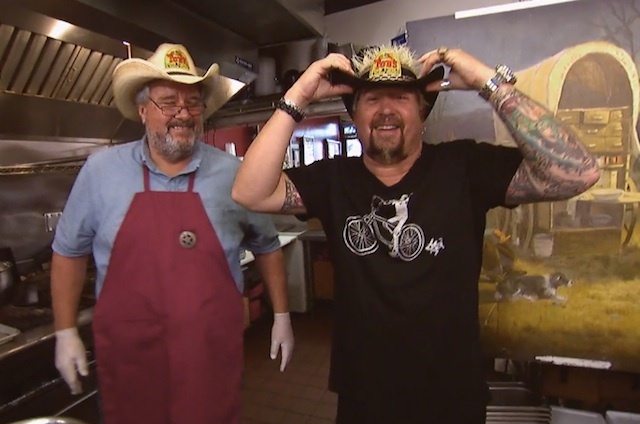 Now these were just a sampling of some of the spots Guy has hit up for "Triple D." For a complete list to inspire you to travel to Flavortown on your own, click here.